Annual global conference of World Beyond War. 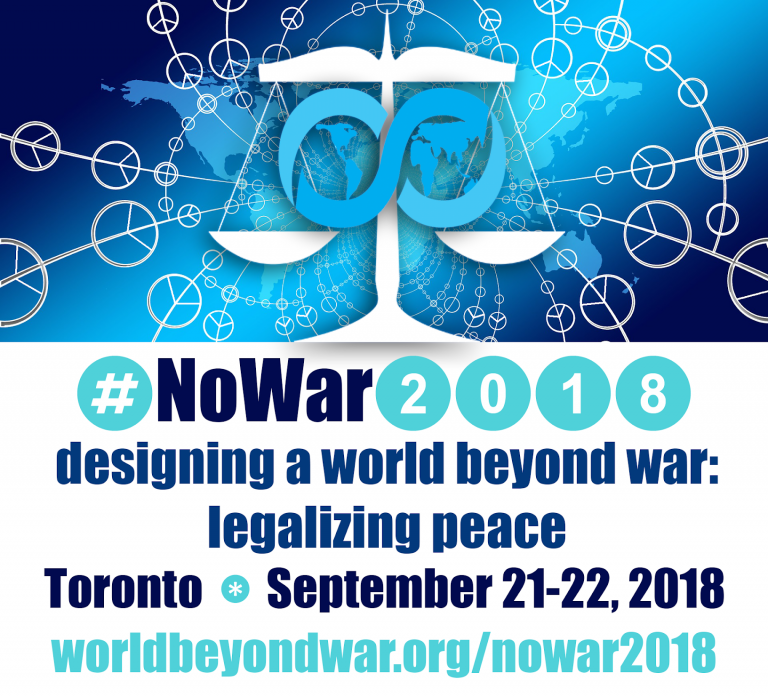 The conference will explore how the rule of law has been used both to restrain war and to legitimize it — and how civil society can re-design systems to abolish the institution of war and uphold human and ecological justice. Thursday, September 20, 6:00 p.m. – 8:00 p.m. in the Lambert Lounge, on the first floor of the main building at OCAD University: Inside Iran: Exclusive Book Talk with CODEPINK Co-Founder Medea Benjamin. RSVP. Friday, September 21, 1:00 p.m. — 3:00 p.m. Canadian Voice of Women for Peace (VOW)’s Annual General Meeting at 519 Church St, Room 301 in Toronto. Open to the public. Sunday, September 23 at 10:00 a.m. — 12:00 p.m. “Inspirational Women Brunch: Shaping Peace Through Feminism” hosted by Canadian Voice of Women for Peace (VOW), with special guests Medea Benjamin and Ray Acheson at Metro Hall, Room 308, 55 John Street, Toronto. Join #WomenShapingPeace for brunch to talk peace over pancakes and learn how you can take action to make our feminist vision of peace a reality. Purchase tickets here. Sunday, September 23, 2:00 p.m. – 4:00 p.m. Blue Scarf Peace Walk. Meet at Grange Park on Beverly St. just south of Dundas St. W. Get a PDF flyer. Buy some blue scarves.